Prior to the release of the 2011 film Rise of the Planet of the Apes, I had essentially zero interest in the Ape franchise. No desire to go back and see the films of the past and no desire to witness anything yet to come, it simply didn't register on my radar with even the faintest blip. That changed after I caught wind of the positive reactions to that reboot film released three years ago, but even that shift was a rather begrudging one, more of a "Alright, I guess I will check it out" rather than a race to find it with eager anticipation. Much to my surprise, I found myself delightfully entertained and engrossed and emotionally invested in that first film, yet still my pessimism reared its ugly head when the movie concluded and I immediately expressed my doubts about a sequel. 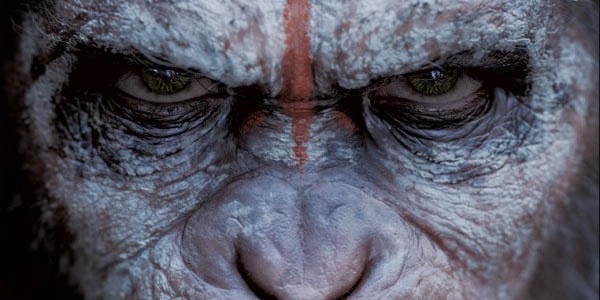 Sure, it was fascinating and rather moving to see the early days of Caesar as he interacts with his human family, and the beginning of the ape uprising was exciting cinema, but the whole fleet of intelligent apes with the ability to speak throughout an entire film was sure to be cheesy and a let down, right? Dawn of the Planet of the Apes is a superior effort to the 2011 franchise reboot in every way, and I believe its existence will make Rise of the Planet of the Apes a better film as well. The story has been built up bigger than I imagined, the scope of the franchise has skyrocketed, and the development of Caesar and his conflicted emotional connection to humanity makes knowing where he came from and how it all began all the more important. After a brief montage of news footage showing the downfall of civilization due to the ALZ-113 virus, we are reintroduced to Caesar and the community of advanced apes he leads located in the Muir Woods. As far as they are concerned, the human race has officially become extinct as they discuss the last time they even caught a glimpse of the species, but that all changes when they encounter a small group of survivors lead by a man named Malcolm (Jason Clarke). Dawn of the Planet of the Apes is an absurdly smart, meaningful film that has an allegorical message to send, but it never feels like it takes itself too seriously or delivers the themes too heavily for the summer blockbuster that it is. What's clear here is that behind the cinematic war between man and ape we have a film addressing the concept of racial divide and the extensive damage such a thing can do, and the aspect that was handled beautifully and thus allows those themes to really resonate is the incredible character development on both sides of the aisle. Director Matt Reeves was given a script to work with that is never biased towards man nor ape, showcasing that on both sides of the war you will find good, those that are willing to learn to trust each other and work towards peace, and you will find evil, those that refuse to accept anything outside of their own, anything unfamiliar, and would rather spill blood than work at finding common ground. The most powerful thing for me with Dawn of the Planet of the Apes was when I realized that the line between a human being and an ape had been completely blurred, that I no longer looked at either one differently in any way after I entered the experience worrying that the idea of them speaking might come across as silly. Both Caesar and Malcolm deal with the struggles of leading personalities that conflict with their own. They both have families to protect and deal with the pain and bliss that accompanies love, and while characters across this film from either species look different from one another on the exterior, in their eyes I saw the same thing: a soul. By the time the final frame went black, I couldn't believe I ever had doubts. Dawn of the Planet of the Apes is a thrilling blockbuster, one that you absolutely should not miss.